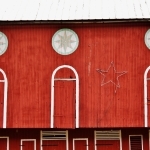 Although Berks County, Pennsylvania is considered ground zero for barn stars and hex signs their appeal has spread widely since gaining a foothold in pop culture during the 1930’s. 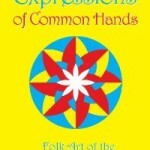 Carol Hartmann Champeau lives and works in Door County Wisconsin designing and painting her signs by hand. 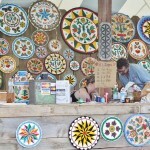 Judging from this article the demand for hex signs is still strong, even in locales far removed from the Deitscherei.